Sharpened cleavers are pressed in rhythmic motions with nothing but a thin piece of material between the patient and the blade. Hsiao Mei Fang, the owner of Ancient Art of Knife Therapy Education Centre, in Taipei, Taiwan, has been performing the strange procedure for more than 13 years. But says people are now seeking out the treatment, which starts from around £30. Ms Fang said: "The treatment is originally from China and is 2500 years old. "But here we have created an original and new knife therapy. "Everything has a Yin and a Yang, so instead of using one knife we use two - this represents the Yin and Yang. "The massage changes the energy inside the person and makes them more relaxed. 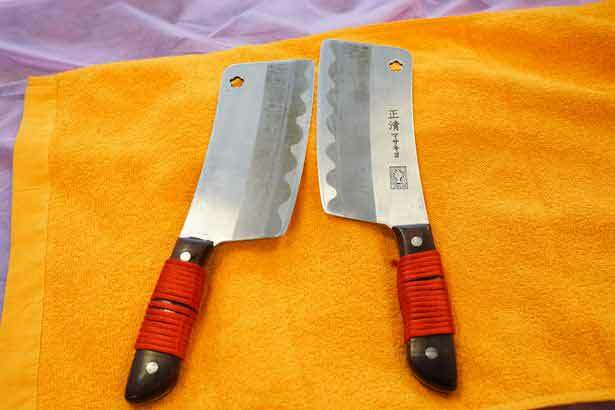 "The knife is specially made so it's very safe. We wouldn't use a kitchen knife to do this." She added: "A lot of people think it's just for fun but people don't realise this will change their lives. After they have experienced it they tell their friends and they all come to us." After sharpening her tools Hsiao uses a stick to loosen up the blood vessels and improve the circulation of the client before moving onto the massage itself.